It’s neither safe or productive to have very long lines of conveyor that can’t be crossed. For productivity, people usually need to move around a warehouse, even if they spend extensive amounts of time in a stationary role like assembly or order picking. Workers need to be able to switch positions, cover different areas or access supplies. Even if the walk around is only fifty feet, that can be multiplied by the number of times the walk happens, the number of people who have to do it, and the number of shifts per day. This wasted time mounts up. More importantly, it’s unsafe for people to walk around a long line in the event of an emergency evacuation. Local safety and fire codes may differ, but you need to understand those regulations and comply with them at the minimum. Conveyors are sometimes built with “overpasses” that incline a line up and overhead, then decline to create a crossing point. This method is efficient from both space and productivity standpoints. Product flow isn’t interrupted, and people can cross without either mounting stairs or opening a hinged gate. There are some space considerations — you need space for both the incline and decline in the line and overhead space of at least 7 to 8 feet. This can be more if you expect to accommodate forklifts or order pickers. This also allows push carts through with ease, which crossovers and gates cannot do. This method consumes some line space, but none to the sides as a crossover would. If wheelchair accessibility is a factor, this is an excellent method. Since it involves conveying loads up an incline and down another, it may reduce throughput speeds. 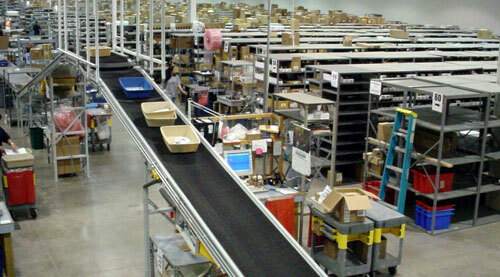 It is likely the costliest conveyor line passage method. An overhead system is frequently used in a long line, such as in front of a large number of picking bays. This allows people to pass beneath it in either a controlled situation (the crossing points are blocked except in an approved space or spaces) or beneath the entire run of conveyor. This style is typically used to allow large amounts of traffic to cross at the same time. In some cases, forklifts can use these passages. Adequate space between the top of the belt or rollers and the bottom of the crossover for the tallest product to pass through. Adequate overhead space between the crossover and the ceiling or other obstructions for a person to walk through. Crossovers should leave adequate side-to-side space for loads that may overhang a conveyor belt. Crossovers are convenient for warehouse personnel. If people pass through carrying loads, a crossover can allow them to do so without stopping to open a gate. They tend to be more expensive than gates, particularly gravity gates. Use crossovers when you have space and frequent traffic. In those situations, they are worth the cost difference vs. a hinged gate and may be less costly than an overhead incline/decline solution. Crossovers are ideal for crossing multiple, parallel conveyor lines. Gates are impractical for these applications, as people would have to open multiple gates to pass. There are many crossover alternatives. For instance, for certain applications, you can cross using ladders rather than stairs. Conveyor gates are fitted onto the line and must be manually opened and closed each time they are used. 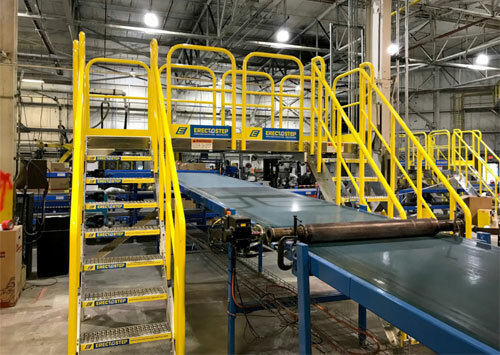 They are typically the most economical solution to crossing a conveyor, and also have the tightest footprint, in essence absorbing no additional space, either vertically or on the sides of the line. A hinged gate stops product flow while it’s open, which can be a throughput issue if accessed too frequently. Hinged gates require people to open and close them. They aren’t ideal for frequent crossing points for this reason. If workers hand-carry loads, this can be an issue. Hinged gates may be heavy if they aren’t spring-assisted. Gates may not be suitable for very wide conveyors (they may not be available in some widths) due to weight considerations. Use gates for safety applications where space is tight and where crossings are infrequent. The safety aspects of having an adequate number of crossing points can’t be overstated, but it is also great for maintenance, repairs, plant tours and other needs. Your plant personnel should know where all crossing points are, how to access them and when to access them for safety and productivity reasons.